[New York], September 15, 2012 - Custo Barcelona presented "X-ray", its new Spring/Summer 2013 collection, during New York Fashion Week. Created in the union of components to formulate one-of-a-kind fabrics and innovative textures, X-ray exudes architectural lines and sheer, comfortable volumes, together with pieces that hug more closely to the body. Graphics inspired by the seabed, the cosmos and the constellations are also prominent on the lighter pieces and can be found on mirror-like fabrics and silk and nylon transparencies. Netting and tulle in bright colors also prevail as key fabrics in the collection, in coordination with metallic film prints, Lurex, elastic bands in various shades and geometric lace. Natural-fiber jacquards in fluorescent colors further form the basis of this new graphic collection by Custo. “At Fashion Trendsetter, we love to feature the fashion designers that are using creative color palettes. 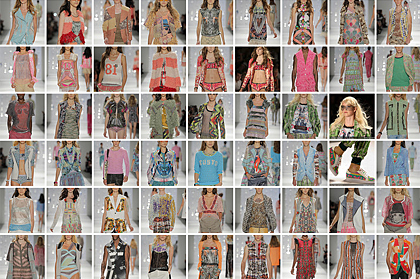 Custo Barcelona had illuminated New York Fashion Week last year with a New Color Palette for its Summer 2012 collection. 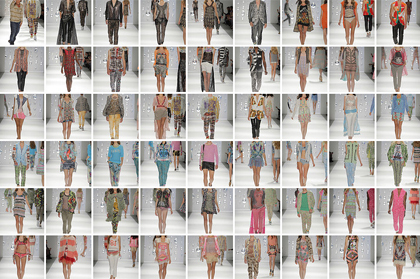 This year was no surprise, we knew that we would fall in love again with Custo’s color choices. We’re amazed with Custo’s “identity prints and colors”, sheer fabrics and exclusive use of trimmings and hand-crafted details” says Senay Gokcen, Editor-in-Chief of Fashion Trendsetter. In accessories, the glasses were handmade from acetate in pastel tones with futuristic touches especially for the catwalk. The bags and watches played on the genuine, colorful geometric design and combined flawlessly with the palette used in the garments, making them the perfect final touch to top off the looks in X-ray. The runway show was attended bya multitude of spectators, who did not want to miss a single detail of the new Custo Barcelona collection. Seated in the front row were Alexa Ray Joel, America's Next Top Model Judge Jay Manuel, Celebrity Stylsit June Ambrose, Miss Universe Leila Lopes, Miss Teen USA Logan West, Actor Vincent De Paul, and James Goldstein among many others. The Dalmau brothers, Custo and David, created Custo Barcelona in the early 80's after a long trip during which they travelled all around the world. Their journey allowed them to discover not only new landscapes but the most varied of artistic, cultural and philosophical expressions. Amongst the things they found to be most worthy of interest were the typically Californian style they saw on the surfers who lived in the southern part of the state and the psychedelic look they observed in the northern part. The brothers were impressed by the colorful and innovative fashion trends they came across, and in particular the style of the tops and T-shirts which didn't exist in Spain in those days. Using the above as a starting point, the brand was launched under the name "Custo Line". The Dalmau brothers got to work and learned everything there was to know about printing techniques and finishings, paying special attention to graphic design, a field they felt particularly comfortable with. Through time, their research on the use of color and prints has given risen rise to designs that are innovative, bold and sophisticated. Later on, all kinds of new garments were introduced to complement Custo Barcelona's trademark printed tops, like skirts, trousers and coats, thus giving rise to complete collections.Nowadays it could be said that Custo Barcelona is a style in itself; one that, to a certain extent, embodies a specific lifestyle.